The re-branding has been in the works for a while and the project has, at times, been referred to by both names. The project extends the subway from its current terminus at Wilshire and Western to a station at the VA Hospital in Westwood. 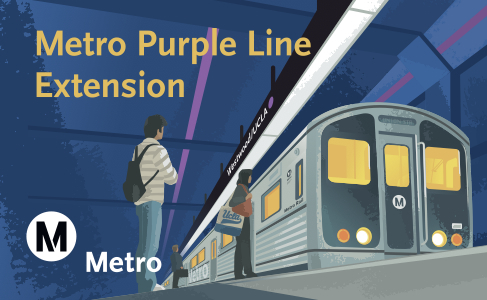 Why wasn’t it just called “Purple Line Extension” from the get-go? The short answer: the project wasn’t officially a subway until the environmental studies were complete. Whatever you want to call it, when you going to actually extend it? The current schedule has the first phase to La Cienega opening in late 2022. The second phase to Century City is scheduled for 2026 and the third phase to Westwood in 2036. Metro is working to accelerate the construction of Measure R transit and road projects, including the subway. Do you know Steve is that time frame due to a trickle in of funding or does the project simply take that long? Are there any other cities building subways in the 21st century to compare? Would that county measure that failed last November have made a difference? The original timeline was spelled out in the Measure R spending plan because tax revenues can’t flow to one big project all at once. So the big constraint is funding although tunneling and construction of underground stations obviously makes this a longer time frame. In the U.S. the two subway projects underway I’m aware of are the 2nd Avenue subway in New York and the Central Subway in San Francisco. I also know that part of a new light rail in Seattle is underground. The feeling at Metro is that if money can be found, the project could probably be built in a decade or so. Im not sure whose brilliant idea it was to only build it to wilshire/western and not at least to miracle mile so people go get to the museums and other tourist places. Metro needs to look at making profits on their own and use them as a source of funding instead of waiting for Congress to send money to them. Politicians in Washington can’t be trusted. We’re better off finding money on our own. We used to be the awe of America when it came to this. Somewhere along the way we got lazy and started being dependent on the feds to give us welfare. It’s time we go back and make Los Angeles a “can do” city once again all on our own. We don’t need the feds. We can do it all on our own. We did it way back when we had the Pacific Electric rail lines. No government money was used to build them. And it was the best in the nation! What happened to this spirit? Can’t Metro look into making money off of the real estate properties they own? Build a luxury condo or a shopping mall on top of a Metro owned subway entrance and sell it or rent it for profit or something. Or how about converting those free parking lots to paid lots? All of these are gold mines in which Metro can earn serious profit on. Instead they are just sitting on them. Stop wasting time with Washington and start finding new ideas of making money. If that can be done, then it solves the funding issue to start accelerating more projects on their own, instead of finger crossing for years waiting for the dullards we have in Congress to pass a funding bill. Los Angeles has always been a city that found solutions for the most difficult problems. It’s time we get serious and do exactly that. Some of the issues that lengthen the time required for a tunneling project include the time needed to design/order/build/ship/assemble the Tunnel Boring Machine(s) (these are not off the shelf pieces of equipment, they are custom ordered/built so that’s a year or more). Once tunneling starts, the machines push ahead 4 feet at a time, about ten pushes (or 40 feet) a day. Given the over four miles of tunneling (for each bore) just in Section One, that’s over two years just driving the tunnels (five days a week), then there’s the time needed to construct the interior finishes of the tunnels, hand mining the cross passages, installing all the systems (track/power/lights/life safety, etc.) not to mention building the stations as well. It’s just not possible to build them overnight…. @Reawakening of LA : converting park and ride to paid parking – perfect way to encourage population to use public transportation instead of car. Many people use metro because this way they can avoid parking fees in downtown. With adequate funding Metro could order several TBMs, accelerating construction 2-3x. It all hinges on $$$. So funny how they get all the names in line for a train that won’t be built for maybe another 5 years. Why, oh why, can’t they extend it one stop south to intersect with the Expo line. “Subway to the sea” is never going to pencil out once the Expo line is done and at some point they WILL extend it. Why not just do it now? Ridership and functionality would be so much better. And Crenshaw should be ending at HiHo. Argh! So frustrating. @switchbox–there is a long political reason for it. It would take some time to explain all the details, but basically, politicians responded to public outcry (back when the subway was something that people feared) by stopping construction along the gassy Wilshire corridor and instead was sent north. If the politicians had acted rationally and with bravery and vision, we would have had a subway to the sea instead of an at grade train to the sea. Quite literally a pipe dream. Because that’s the eventual task of the line that will come from the valley and down the 405… connect with the Purple Line, The Expo Line and the Crenshaw Line / People Mover to LAX. I’m guessing by an optimistic 2035. There needs to be a stop at Crenshaw and Wilshire. It is extreme short-sightedness not to do so. A Crenshaw/ Wilshire stop (or one nearby) might have to wait until the Crenshaw Line is extended to the purple Line.